An Amazon Go store in Seattle, which is currently open only to employees. Amazon appears to be preparing to open checkout-free grocery stores in Britain after registering a UK trademark for its Amazon Go format. The online retailer opened its first bricks and mortar foodstore on 5 December near its headquarters in Seattle. Amazon employees can shop there and it will open to the public early next year. Customers can walk out without queuing or paying at a checkout. Instead, sensors record the items they pick up and charge them to an Amazon Prime account. 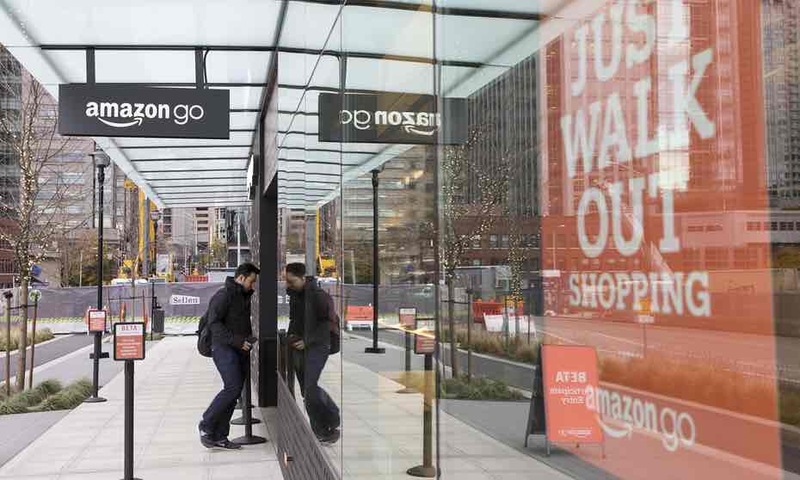 Amazon has remained quiet about whether it plans to launch Amazon Go outside the US. It registered a UK trademark on 5 December, indicating it intends to bring the format to Britain. Campling said Amazon used the UK as its first non-US market for new formats because UK consumers have proved themselves open to new ideas such as online shopping and Britain has few trading restrictions to stop Amazon shaking up the market. What is convenient for shoppers could be bad news for retail employees. The New York Post said Amazon Go would “automate American workers out of existence”. A US analyst estimated Amazon’s technology might eventually wipe out three quarters of US grocery store jobs. Before the launch of Amazon Go, the British Retail Consortium predicted almost a third of the UK’s 3m shop jobs would disappear by 2025 as companies use technology instead of people. If Amazon Go catches on in the UK, established retailers would probably be forced to match its convenience to keep their customers. The prospect of rapid automation of the retail industry has added to unease about the use of technology to replace human workers. Capita, the outsourcing company that collects the BBC licence fee, said this week it would cut 2,000 jobs and plough the cost savings into developing robots. The Bank of England’s chief economist Andy Haldane warned earlier this year that 15m UK jobs could eventually be lost to robots. Amazon has rejected reports that it intends to open more than 2,000 physical grocery stores in the US, including shops as big as 40,000 sq ft – about the same size as an Asda store. Jeff Bezos, its chief executive, said in May more stores were on the way but the company said this week it had no grand plan and was still testing the market. Amazon has made it clear that it is targeting the UK retail market. In February, it announced it would sell fresh and frozen food to UK consumers in a deal with Morrisons and in July it launched Amazon Fresh to sell fresh food to selected postcodes. It is also developing a clothes range, after helping revolutionise the books, music, home entertainment and consumer electronics sectors over the past decade. The Seattle Amazon Go store is 1,800 sq ft and sells food staples such as milk, bread and chocolate as well as ready meals. Its opening follows the launch of a physical bookshop in its home town in November 2015. Amazon Books at University Village in Seattle stocks 6,000 titles, with the selection based on reviews and sales data from Amazon.com. The price of books in the store is the same as on the website. Further bookshops are now also planned for San Diego, New York, Portland and Chicago. Amazon did not respond to a request for comment about registration of the UK trademark. Posted on December 9, 2016, in Other. Bookmark the permalink. Leave a comment.